The HTC One A9: iPhone on the outside, but what's it like on the inside? Its look has received a lot of attention, but is it worth getting? Verdict: A solid HTC phone but it’s let down by battery life and high price tag. SINCE ITS ANNOUNCEMENT, the only comment that has surrounded HTC One A9 is “it looks like an iPhone”. The company has had a troubling year, and is in dire need of a hit, but it has people talking about a phone that would likely have been overlooked in a packed market. The intention to design it this way was deliberate, but why it went down this route is open to interpretation. Some have raised their eyebrows at its design, and others suggested it’s HTC getting its own revenge on Apple – but now that it’s out there, is it worth getting? We’re not kidding when we say this is the iPhone in Android form. Place an iPhone 6s and One A9 side by side and bar some minor differences, it’s difficult to tell them apart. Everything that was said about the iPhone 6s’ look and feel can be applied here, right down to the all-metal design. It’s probably the most blatant case of mirroring Apple’s look since Samsung’s original Galaxy S was released back in 2010. Instead, let’s talk about the parts that aren’t similar. Of the new batch of Marshmallow phones coming up, the A9 is one of the first to have its own fingerprint scanner, and it acts as a home button as well. The camera is located at the top-centre and juts out ever so slightly, while the power and volume buttons are located on the right-hand side. The 5-inch screen is a good size for a phone like this yet it feels slender, even a little dinky, when you put it in your pocket. It’s comfortable to hold and just the right size to make it easy to use. The disappointing part is that while it’s practically a good design, it’s sad that HTC had to resort to this. While it took much criticism for not changing its design for the M9, this feels like it went too much in the opposite direction. The aspects that made HTC phones unique aren’t here to be seen, like the speakers which delivered great quality sound for movies and songs. The outfit might scream Apple but the inside has the bones of a good mid-range device, just shy of flagship range. A Qualcomm Snapdragon chipset, a quad-core 1.5GHz and 1.2GHz CPU, 16GB/32GB of space, and 2/3GB of RAM is good going and you certainly feel it when running the more demanding tasks. There were some moments of slowdown with various games, but not enough to disrupt the flow. In many ways, it’s a diet One M9, with a few things dialed back somewhat. The battery is smaller with a 2,150 mAh, and considering how power-hungry it is, you will find it difficult to make it to the end of the day if you’re a heavy user. If you’re not, then there’s a feature that will make things more bearable. A disappointing aspect of the new design is it sacrifices the front-facing speakers. HTC phones were always great for surround sound and while the quality is decent, the impact isn’t there. When you start using the phone itself, and you get past the iOS-like fingerprint setup, the main attraction isn’t anything from HTC, but the new version of Android. Marshmallow fixes many of the problems associated with Lollipop (looking at you, volume settings and Do Not Disturb) and brings with it a few new useful features. The obvious ones are things like fingerprint scanning as standard (which recognises your print in a moment), app permissions asked for first before use and Google Now on Tap (which picks out keywords and presents you with relevant links on them). Yet the biggest improvement is one that works behind the scenes. Doze isn’t a feature you will come across when using it, but you won’t notice its benefits until you leave your phone alone. Designed to help save battery, your phone senses if your phone isn’t in use for a while and if so, it turns off everything in the background save important notifications like texts and calls. The reality of it so far is a feature that gives your battery life a much-needed extension. The benefits aren’t exactly massive, but they’re noticeable, and that in itself is an achievement considering how little battery tech has changed. Yet its impact is dependent on how much downtime you allow your phone. If you’re a busy user, you’re not going to make it to the end of the day. 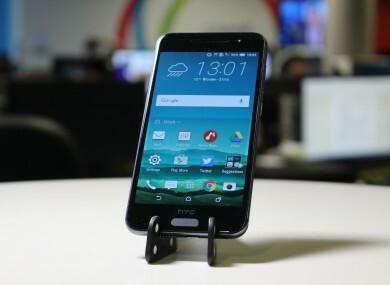 As for HTC itself, its features are the same as the M9, functional if not great. HTC Sense still acts as a Flipboard-like clone while other features like themes (where you could download an iOS-like look if you really wanted to) and its Zoe video and image editor function just as well as you’d expect. The same applies to its location widget, which presents relevant apps based on your location (home, work or away). They’re small additions but play a minor supporting role to the benefits Marshmallow brings. HTC has put a lot of work into its camera for this edition – and it’s a solid camera. The inclusion of Auto and Pro mode as well as slow-motion seems to be the norm for many native cameras and it’s a case of ticking the boxes. The colour and exposure of shots is rather sharp; there is enough vibrancy in your images and the camera does focus rather quickly. There were moments where the camera would take a little longer than expected to boot up, sometimes directly from the lock screen, which doesn’t bode well if you want to regularly take on-the-spot photos. There are some good additions. The ability to take RAW photos is a welcome addition for those who like the option, and the ability to convert normal video into hyperlapses is one that many will play around with. The front-facing camera is also rather solid, with beautifying features – smoothing out and brightening the skin – although it’s inconsistent when dealing with less than optimal lighting conditions, both bright and dark. There are two reasons why you would want to purchase an A9. The first is it’s the first non-Google Nexus phone to come with Android Marshmallow and the second is its design. Whether you like it or not, it has already received enough attention for the latter alone and that would make people seriously consider buying one. The inclusion of Marshmallow also gives it an advantage, especially for those who would rather go for bill-pay where the upfront costs are cheaper. Yet it’s a tough one to recommend. The mid-range market is flooded with great mid-range devices, and more importantly, the likes of the Moto X Play and OnePlus Two are cheaper. Even Google’s Nexus 5X, which is only available unlocked, is cheaper than the One A9. While Apple can point to iOS, the App Store and its general ecosystem as unique selling points, HTC doesn’t have that. Instead it has to compete against many other similar Android devices, those that could put forward a better case than the A9. It’s a shame that for all the similarities the A9 has to Apple’s flagship range, it had to also mirror it with its pricing strategy. - Android Marshmallow brings much-needed improvements. - Design is virtually similar to the iPhone 6s. - Battery life is poor for heavy users. - Price point is high. The HTC One A9 costs €549 unlocked (starting free on bill pay) and will be available in Vodafone, Meteor, Three, Carphone Warehouse, Tesco Mobile and ID Mobile at the beginning of November. Email “The HTC One A9: iPhone on the outside, but what's it like on the inside?”. Feedback on “The HTC One A9: iPhone on the outside, but what's it like on the inside?”.